Psychologists generally consider creativity to be the domain of the young. In this they have followed the lead of Harvey Lehman, who in 1953 conceded that "the old usually possess greater wisdom and erudition," but claimed that "when a situation requires a new way of looking at things...the old seem stereotyped and rigid." Lehman and his successors are guilty of ageism: in this case, a mistaken belief that creativity is inversely related to age. Mark Twain knew better. 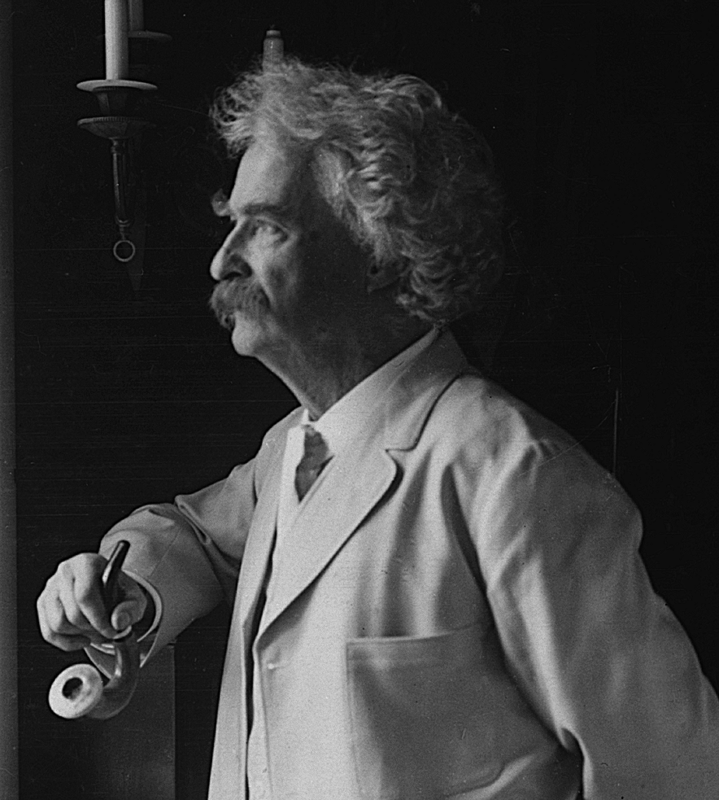 For Twain, experience was what brought fiction to life, and could only be the product of deep knowledge of a subject: "Almost the whole capital of the novelist is the slow accumulation of unconscious observation." The writer also needed experience of his craft: "Every man must learn his trade...by slow and painful processes." The novelist Wright Morris compared Twain's growth to the skill of a ship's captain, observing that he "learned to write the way a river pilot learns the feel of a channel." Mark Twain, in 1907. Image courtesy Wikimedia Commons. T.S. Eliot recalled that reading Tom Sawyer -- "a boys' book, and a very good one" -- had not prepared him for Huck Finn, "the only one of Mark Twain's various books which can be called a masterpiece." 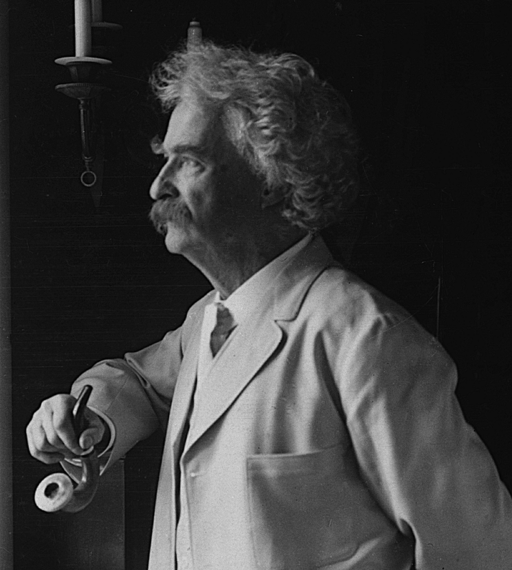 Eliot commented that Twain's growth in the decade between the two books was not only in the use of language, but also in the form of narrative: "We look at Tom as the smiling adult does: Huck we do not look at -- we see the world through his eyes. The two boys are not merely different types; they were brought into existence by different processes." Eliot recognized that Huck Finn was an experimental work, based not on a preconceived plot but on discovery during its production: "Huckleberry Finn is not the kind of story in which the author knows, from the beginning, what is going to happen." Twain's experience, both of writing and of growing up on the Mississippi, allowed him to create a real boy who lived in a real world: "He sees the real world; and he does not judge it -- he allows it to judge itself." The result was a character who was worthy to stand with the greatest creations of Western fiction -- Ulysses, Don Quixote, Hamlet, "and other great discoveries that man has made about himself." It is past time for us to stop being beguiled and blinded by the conspicuous pyrotechnics of young conceptual innovators, and to recognize that the subtle and gradual discoveries of older experimental innovators have made no less of a contribution to our culture. Just as we now condemn racism and sexism as not only unfair but mistaken, we must reject ageism as both bigoted and erroneous. When Mark Twain published Huck Finn at the age of 50 -- the same age at which Charles Darwin published the Origin of Species -- he was wise and erudite, but hardly stereotyped and rigid. In rejecting the ageism of poor scholarship, we should follow a maxim of Mark Twain's that Harry Truman always kept on his desk: "Always do right. It will please some people, and astonish the rest."